A unique design, engineering and tooling company serving production and one-off power and sailboat builders worldwide. We design, engineer and tool boats and yachts which are at the forefront of design and technology, easy to manufacture and sell. The J&J design office was established in 1983 by Jernej and Japec Jakopin. Web Site Snapshot: If available, above is a snapshot of the The Seaway Group / J&J Design office web site at http://www.seaway.si/ as it appeared when this site was added to the directory or last verified. 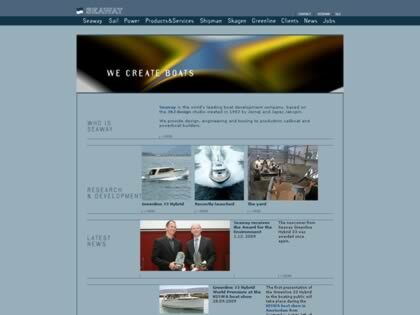 Please Note that Boat Design Net has no involvement with the above web site; all content and images depicted in the above thumbnail are the property and copyright of The Seaway Group / J&J Design office unless otherwise noted on that site. Description: A unique design, engineering and tooling company serving production and one-off power and sailboat builders worldwide. We design, engineer and tool boats and yachts which are at the forefront of design and technology, easy to manufacture and sell. The J&J design office was established in 1983 by Jernej and Japec Jakopin.